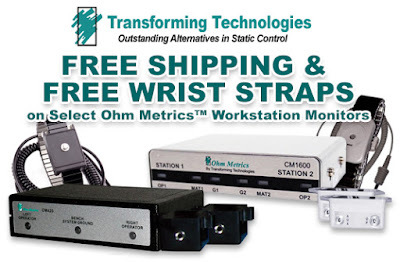 Q SOURCE EXCLUSIVE: Get a FREE metal wrist strap and FREE Shipping on select Ohm Metrics™ ESD Workstation Monitors from Transforming Technologies thru December 31, 2015. Visit QSource.com today to make your purchase. Created to help you get the best quality products for ESD protection, this promo saves you shipping costs on the eligible ESD monitors (CM400 & CM1600 Series) and provides a FREE wrist strap based on which monitor model you select (either the WB6037 or WB5050L). Shipping will be deducted at checkout and the FREE wrist strap will be automatically included when you add an eligible monitor to your cart. Transforming Technologies’ CM400 Series uses specialized capacitive sensing technology to continuously monitor single-wire wrist straps and bench. If a ground failure occurs, the user is informed via instant, audible alarm, and LED lights. The CM400s are compatible with most single-wire wrist bands and require no calibration. We’ve previously (“Transforming Technologies Resistance Ranger Constant Monitors/High-Accuracy, Low-Cost ESD Monitoring”) told you about Transforming Technologies’ new Resistance Ranger Series. Check out our blog to learn about these low-cost, high-accuracy ESD monitors. With your purchase of an eligible Transforming Technologies ESD monitor, you receive either the WB6037 Transforming Technologies Premium Metal Wrist Strap Set (with the CM400 Series) or the WB5050L Transforming Technologies Dual Conductor Speidel Metal Wrist Strap (with the 1600 Series). The black WB6037 features a 360° conductive contact, 6' coil cord, 4 mm Snap, 2.5 mm polyurethane coil insulation, a swivel-type banana plug, and a maximum resistance of 160 ohms. The black WB5050L features two stainless-steel back plates, a double-insulated jacket, two 180° conductive paths around the wrist, and is designed for use with dual conductor workstation monitors. Visit our Transforming Technologies Free Shipping & Free Wrist Strap with Ohm Metrics Workstation Monitors page to take advantage of this FREE shipping/FREE wrist band offer. For related products, check out our Transforming Technologies page. You may also contact us by phone (800-966-6020), email, or via our Web site.